I can’t believe its over a week since I talked to you all. Over at Stampotique is GESSO week. 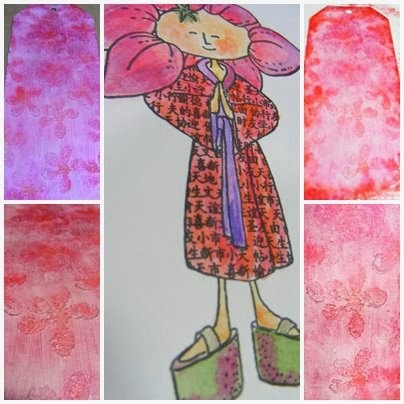 I started by getting a tag and smearing it in white gesso all over, then getting a bowl of warm water ready, so that when I pressed my Stampotique flower cube into it, I then washed the paint off straight away, otherwise it would render my stamps unusable. I then heat dried it with a heat gun. The indentations of the flower stuck out from the tag. I then sprayed cranberry Ranger inks on the top and patted it off with a piece of kitchen roll. I then went over the flowers with H2O’s in red, highlighting the flowers. I then stamped the flower out onto patterned cardstock with fired brick distress ink and cut them out adding a glaze over the top. The words I printed off my computer. I then coloured in ‘China Belle’ with watercolour paints and cut her out. This is fab Sue, it all works together so well. Thanks for joining us again at Stampotique this week. 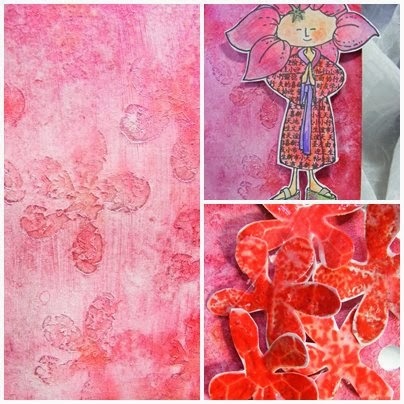 Great use of gesso, Sue, for creating a textured background! Sweet image and perfect for your tag! Yep, Gesso is our friend! great tag! I don't do much mixed media but I appreciate all that you put into it. thanks for playing with us at Pile it On.